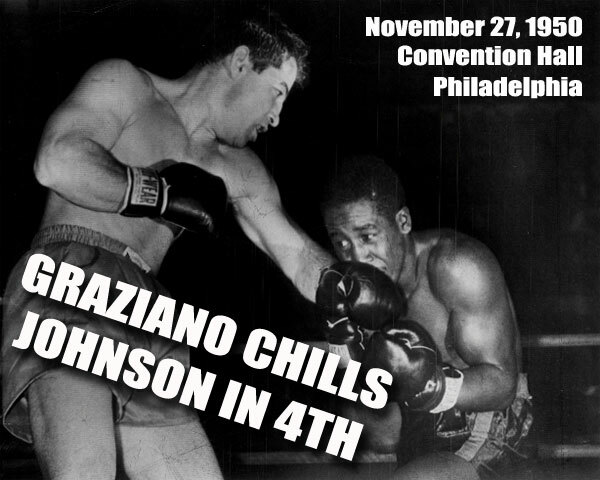 Rocky Graziano put the chill on Honey Chile Johnson 48 seconds after the bell started the 4th round of their battle before 8,500 fans at Convention Hall last night. It was a right that did the trick, the kind of right they use in fiction stories. It swept up and over Johnson's left and hit his jaw and he just fell away from it, slid away, and went down, turned over on his belly, and was counted out. It was a punch he had been asking for ever since the first bell of the first round sent the two into action. Instead of fighting the smart way and taking advantage of his greater speed and skill, Honey Chile went into the fight as though it were all his and just a matter of time. You got the impression Johnson was the fellow with the knockout punch and Graziano was the boxer. In other words, he reversed roles. It wasn't a bad idea, either, for a certain length of time, and in the second heat he split the Rock's eye with a looping right. He turned around with another punch. He looked like a killer. But then the Rock threw his right, and values reassumed the norm. Honey Chile went down for good., not to get up. Referee Charlie Daggert could have kept right on counting to 100. The amazing feature of the fight was that it went so long with Honey Chile using these tactics and charging in to trade punches instead of trying to keep out of range and pile up points for a decision victory. He not only surprised the fans but he also surprised the Rock, who could hardly believe his eyes, until one of them opened. Then he wound up and took what the kids call dibs on the Johnson chin and it was all over but cleaning the ring. In the semi-final, Rudy Cruz, of California, upset Arthur King in 10 rounds after King had two beats taken from him for out of bounds punching and what they call unnecessary roughness on Franklin Field. Jimmy Flood kayoed Jimmy Hayden in one round; Gil Turner stopped Joe Brewer in One; Joe Giardella (sic) drew with George Roberts, and Joe DeLiberto stopped Joe Mayne.